Alexey Ivanovich Belsky (1726, St. Petersburg - May 21 (June 1), 1796, St. Petersburg) - Russian artist. Alexey Belsky painted mainly landscapes, allegories and paintings on historical subjects. Being enrolled with his brother Ivan Ivanovich in the "Office of the buildings" in the mid-1740s he studied under Girolamo Bona, I. Ya. Vishnyakov and others. He painted the St. Andrew’s Church in Kiev, the palace churches of the imperial residences, created theatrical scenery, ceiling lamps and panels for the imperial palaces in Peterhof and Tsarskoe Selo. Alexei and Ivan Belsky are listed in the register of artists sent in Moscow to Moscow in 1762 for along to sign the Triumphal Gate, arranged on the occasion of the ceremonial entrance to the coronation of Catherine II. On this registry, the hand of Jacob Shtelin, who led the device of the “artistic part” of the coronation celebrations, made a note opposite the name of Alexei Ivanovich: “a good decorator”. In 1764 he was elected an academician of the Academy of Arts. From the mid-1760s, he was listed as an “appointed artist." In 1771, for a series of four moral paintings-panels executed for the decoration of the Smolny Institute, received an award from the Academy in 70 rubles. (now a panel in the Russian Museum). In 1772, the Academy arranged for A. I. Belsky an examination, according to the results of which the Office of Construction Affairs produced him as a master, and in 1773, on the basis of the regulations of the Academy, Aleksey Ivanovich Belsky and his offspring received liberty. A. I. Belsky enjoyed the glory of the best (along with J. Valeriani) master of decorative painting. Works by Alexei Ivanovich (“Desudeport with a Parrot”, 1754, Russian Museum, St. Petersburg; “Architectural View”, 1789, Tretyakov Gallery) are performed in a wide pictorial manner, often including landscape and genre motifs. Alexey Ivanovich Belsky (1726, St. Petersburg - May 21 (June 1), 1796, St. Petersburg) - Russian artist.<br>Alexey Belsky painted mainly landscapes, allegories and paintings on historical subjects. Being enrolled with his brother Ivan Ivanovich in the "Office of the buildings" in the mid-1740s he studied under Girolamo Bona, I. Ya. Vishnyakov and others.<br>He painted the St. Andrew’s Church in Kiev, the palace churches of the imperial residences, created theatrical scenery, ceiling lamps and panels for the imperial palaces in Peterhof and Tsarskoe Selo.<br>Alexei and Ivan Belsky are listed in the register of artists sent in Moscow to Moscow in 1762 for along to sign the Triumphal Gate, arranged on the occasion of the ceremonial entrance to the coronation of Catherine II. On this registry, the hand of Jacob Shtelin, who led the device of the “artistic part” of the coronation celebrations, made a note opposite the name of Alexei Ivanovich: “a good decorator”.<br>In 1764 he was elected an academician of the Academy of Arts. From the mid-1760s, he was listed as an “appointed artist." 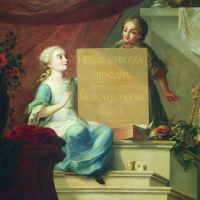 In 1771, for a series of four moral paintings-panels executed for the decoration of the Smolny Institute, received an award from the Academy in 70 rubles. (now a panel in the Russian Museum). In 1772, the Academy arranged for A. I. Belsky an examination, according to the results of which the Office of Construction Affairs produced him as a master, and in 1773, on the basis of the regulations of the Academy, Aleksey Ivanovich Belsky and his offspring received liberty.<br>A. I. Belsky enjoyed the glory of the best (along with J. Valeriani) master of decorative painting. Works by Alexei Ivanovich (“Desudeport with a Parrot”, 1754, Russian Museum, St. Petersburg; “Architectural View”, 1789, Tretyakov Gallery) are performed in a wide pictorial manner, often including landscape and genre motifs.